This is a Bring Your Own Controller/Console event. Please feel free to bring your own setups, stations, or controllers. All ages welcome. Join us at the University of Manitoba, University Centre August 22nd and 23rd for That Summer Tournament X! Saturday and Sunday, August 22 and 23, 2015. Tournaments start at 1:00 pm sharpy. Doors open at 12 noon. $5 Registration fee. $10 Entry fee for each tournament. $10 per person for Team tournaments. If you have questions or comments, please leave us a message on Facebook and we’ll get back to you as soon as possible. Otherwise, feel free to email any questions or comments to goc@chipdamage.com. of a team are eliminated in a FT1 match. Team 1: A & B, Team 2: X & Y. A plays X, and B plays Y. If X and Y win their matches, they progress, but if X wins and B wins, X plays B and the victor’s team goes through. Winner must stick with their character/team in the current set they’re playing. (e.g. If X win and B win their matches, they cannot switch characters when they face each other). No additional character rules for team tournaments. Match format is FT1 all the way through to Grand Finals. Ultimate Marvel vs Capcom 3 and Street Fighter II: Hyper Fighting will be on Xbox 360. 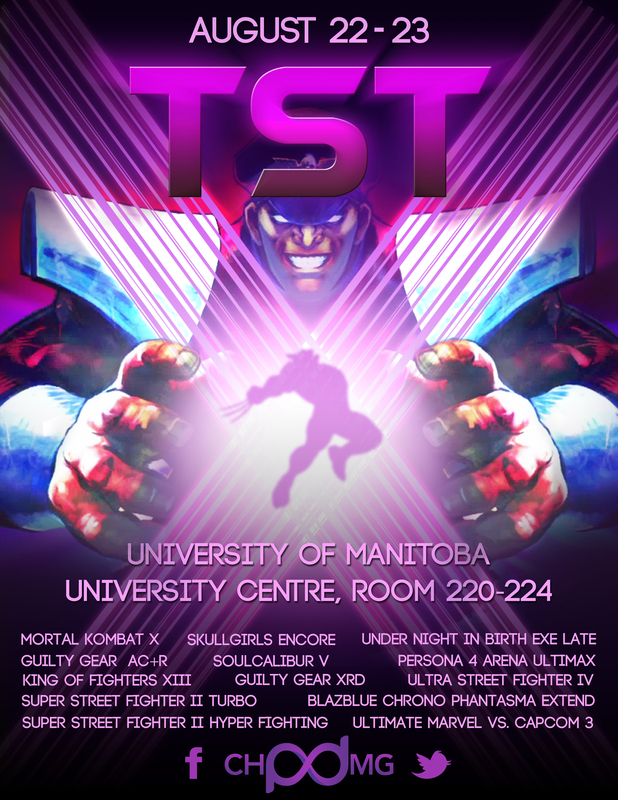 We will need volunteers for UMVC3 Xbox consoles. Mortal Kombat X is on PS4. We follow the standard EVO rule set. This includes banned wireless controllers. This is a BRING YOUR OWN STICKS/CONTROLLER event. All games will be played on US Playstation 3 consoles unless otherwise noted.